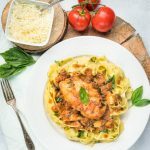 This Fresh Basil Pasta with Chicken and Tomato Cream Sauce is made with pasta from scratch, to impress your guests! The basil infused pasta takes your dinner to the next level! Mix flour, salt and chopped basil. You can make the dough on your counter or inside of a bowl. Either way, make a well in the center of the flour mixture and pour egg yolks and eggs in. If you are doing this on your countertop, be careful so the egg mixture won’t leak out. Make sure the hole you open in the center is deep enough to keep the eggs in. Proceed by throwing flour from the edges over egg mixture with a fork and slowly incorporating the ingredients together. Once ingredients are incorporated, start kneading by hand until you see no more streaks of flour and the dough is soft and homogeneous. This usually takes me about 10 minutes. You can use your KitchenAid and the dough hook to do this, I do like to use my hands, though because they work so much better to incorporate the ingredients beautifully. Now that you have your dough formed into a ball, you can cover it with plastic wrap and let it rest on the counter for at least 1 hour. Or you can put it in the fridge overnight. When it’s time to roll it out, I do recommend a pasta machine. If you don’t have one, be ready to work your arms. For this amount of pasta, I usually divide the dough in half, then into quarters and then into eighths, and roll each piece individually. On my pasta maker, I roll on setting 1 once, then fold the dough in half, roll it once again on setting 1, fold it in half a third time and roll it one last time on the first setting. From then on, I roll it once in each setting until number 6 or 7, depends on how my dough feels. I don’t want it to be paper thin for the purpose of noodles. If I am making ravioli or tortellini, I do like it a bit thinner, but for this, I usually stop at setting 6. As you roll each piece of dough, leave a baking sheet and plenty of clean kitchen towels at hand. Sprinkle flour all over the baking sheet and place the first piece of rolled dough. Sprinkle flour over the dough and cover it with a clean kitchen towel. It’s important to leave it covered otherwise it will dry up and get hard. Sprinkle flour over kitchen towel, place second piece of rolled dough, cover with another towel. And keep doing this until you have rolled all pieces. Since we are making noodles, you can simply use a pizza cutter to cut dough sheets into whatever thickness you want to. If your pasta machine has that feature, use it to cut the noodles. Use plenty of flour so the noodles won’t stick together. You can proceed by hanging them over a pasta drier or simply place noodles on a floured baking sheet. Be very careful because the noodles aren’t dry and they will stick together if you don’t use enough flour or just pile a bunch of them together. I usually use a couple baking sheets so this way I can spread my noodles around a little better and they aren’t clumped up together. Bring a large pot of water to a boil with a tablespoon of salt. Once water comes to a boil, add noddles carefully and boil them for a couple minutes or less. Don’t overcook your noodles. Have in mind they take way less time to cook then dry packaged pasta from the store. At around 1 minute pull a noodle out and taste it to see if it’s cooked. For the purpose of this recipe, save about 1 cup of the pasta water before draining it and set aside. Drain pasta. Start by bringing a medium pot of water to a boil. (or you can use the water you are going to boil your pasta in) Cut stems off tomatoes with a pairing knife. Mark an X at the bottom of each tomato with a knife. That will help you remove the skin of the tomatoes after you scald them. Once water comes to a boil, add tomatoes to the water and scald them for about 60 seconds or until you see the skin start to come off. Remove tomatoes with tongs and rinse under cold water so they stop cooking. Remove skin from tomatoes easily by just peeling them off. Cut tomatoes in half, remove seeds and stems and roughly chop flesh. Set aside. Sprinkle chicken breasts with salt, pepper, garlic powder, paprika and cayenne, on both sides. In a large saucepan, heat 1 tablespoon of olive oil over medium high heat. Add chicken breasts and sear for about 4 minutes on each side or until browned. Remove chicken breasts to a plate. Set aside. Turn the heat down to medium. Add 2 tablespoons of butter to the pan, add garlic and shallots and cook them for one minute or so. Add chicken broth (or water) to the pan to help deglaze and remove the brown bits from the bottom. Add chicken breasts back to the pan and place the lid in the pan. Turn heat down to medium-low. Cook for about 8 minutes. Remove lid and add heavy cream. Cook for another 8-10 minutes. It might take longer or less time, depending on how thick your chicken breasts are. The best thing is to have a thermometer so you can monitor when the chicken hits 165F. Taste for salt and pepper. Add more if necessary. Meanwhile, once chicken is almost done cooking, you should have your pot of water boiling for the pasta. Add pasta to the pan and cook as described above. Once chicken is cooked, add about 1/4 cup of the reserved pasta water to the pan and just bring to a quick boil. The pasta water will thicken the sauce. To assemble, place pasta on the plate. Top with one chicken breast, cover with sauce and sprinkle some of the chopped basil on top. You can garnish with beautiful fresh basil leaves and serve with parmigiano-reggiano.